I'm still thinking about ways to tell you about India. It was so intense in such a short time. I look back at the pictures, and sometimes I can't understand why I didn't capture certain things to show you. And then I remember the heat, and that my brain was always a little fuzzy and it was probably enough for me just to look and listen and do nothing more. So, until I find a way in, I'm going to tell you about what I've done since. A project inspired by indigo. 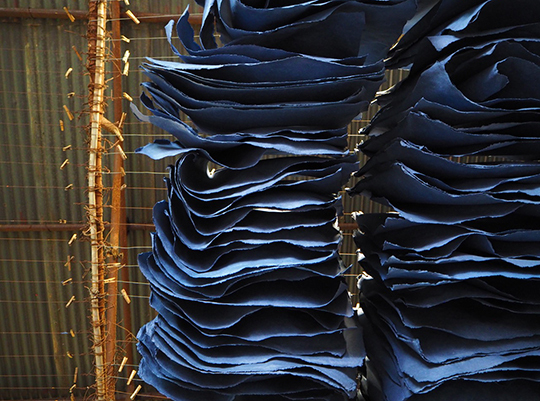 In Jaipur, we saw handmade indigo-dyed paper. 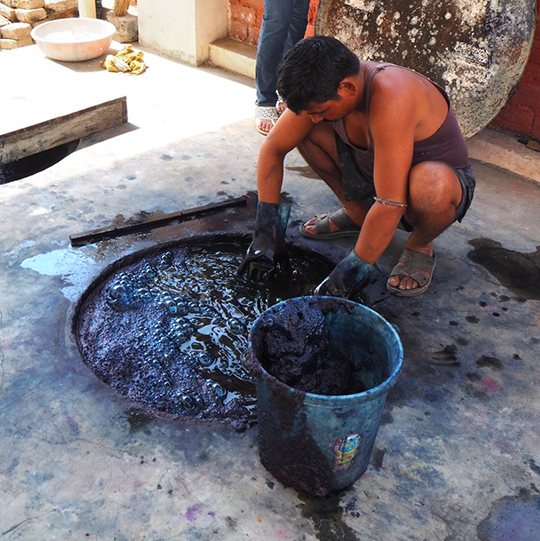 We watched as the dabu master dipped piece after piece of our attempts at mud-resist into the indigo vat. And, of course, I came home with mud-resist and block printed pieces, all with their own nod to indigo. Right from the start, I had in mind what I wanted to make. 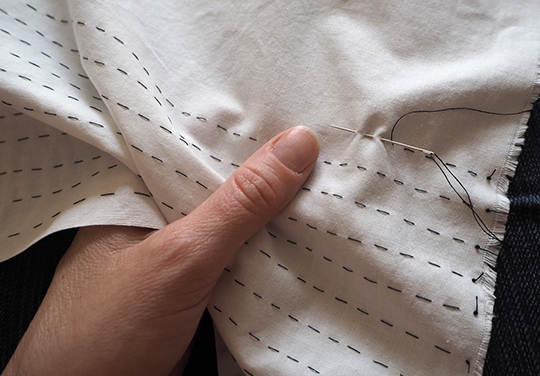 I did a patternmaking course just before I went to India, so I wanted to experiment with that too. 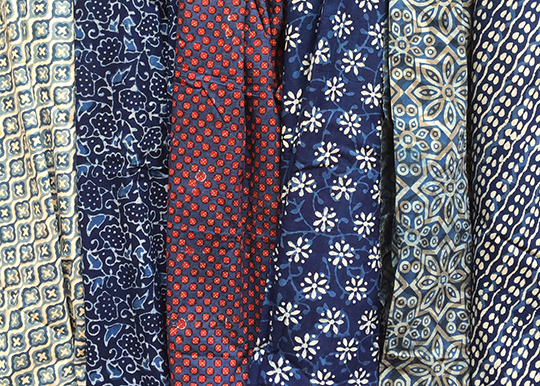 First I needed a bunch of indigo-dyed fabrics all with different patterns. I had ideas of trying out bandhani, the tiny little knots Indians use to create the most intricate patterns with their tye-dye, but after a day of gathering fabric – the stitching above ended up as the piece on the left below – I knew I didn't have time for that kind of detail. 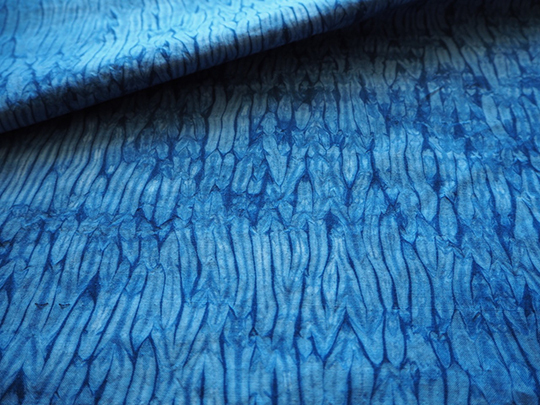 All in all I probably ended up with a more Japanese shibori approach to my dyeing, but effective nonetheless. re-tied it for a second dip. My two favourites are the ones below. 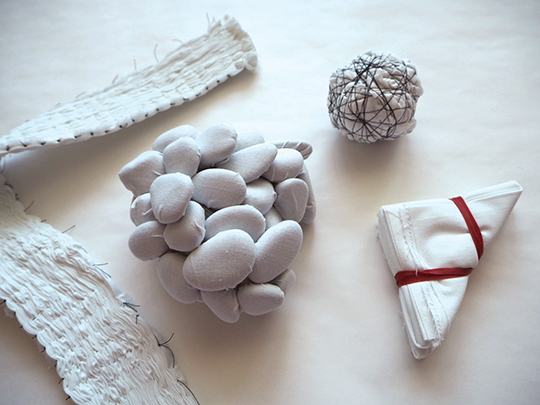 This one was created using stones secured into the fabric with rubber bands. And my very favourite is this one – all that gathering was worth it in the end. 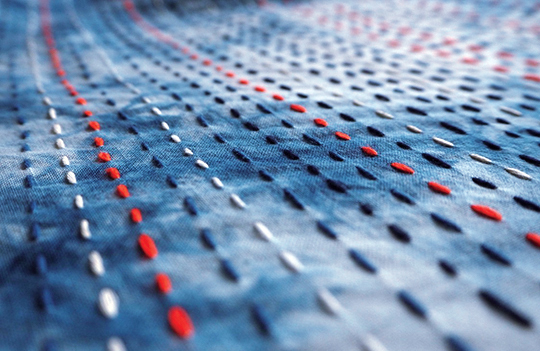 Next – the embroidery. I had seen a piece in India that was indigo-dyed then trimmed with a pop of contrasting colour and it really appealed to me, so I went with orange. The shapes left by the stones looked like a constellation of stars, so I continued the theme with my stitching. 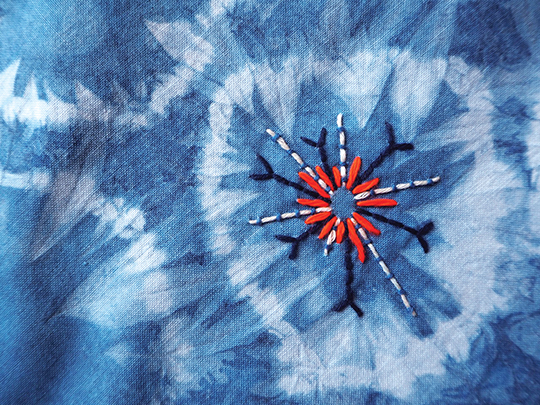 I then took the piece made by the scrunched up dye and covered it with kantha stitching. As my sister pointed out, the dye on this piece was the most reminiscent of 70's tie-dye, so it really did need to be the one to be covered in embroidery. 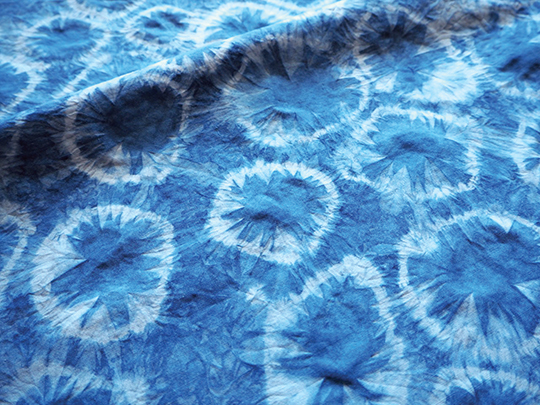 I went cross-cultural again, using shibori thread to stitch my kantha. With the dark shibori thread and touches of dark blue where I'd double-dipped pieces, or kept them in the bath longer, I decided I still wanted to add a bit of really dark indigo into the mix. With a piece of mud-resist fabric I bought in India, I found what I was looking for. 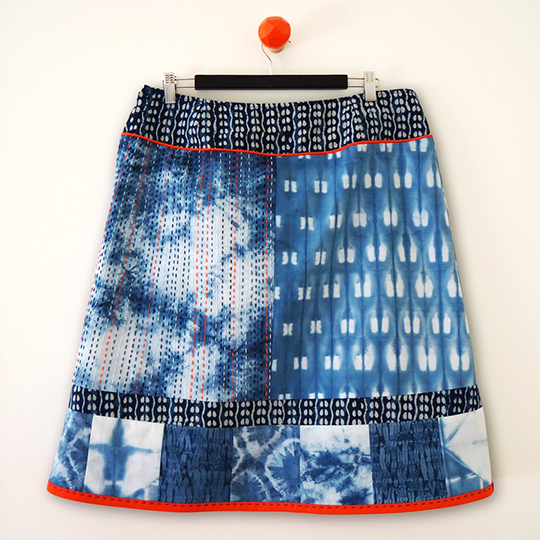 And now for the great unveil – ta-dah, the finished skirt! I'm really happy with how it turned out. I wouldn't even change the intensity of the dye now, as I like the contrast between it and the yoke. Then what did I do? Well, I turned around and made another one of course! The second one was mostly made with fabrics I bought in India, although there is a mud-resist one I did in there too. It's also a little more subdued in its colourway which suits the person I made it for. And there you have it… Over the coming weeks I'm sure I'll be telling you about the block printing and the mud-resist and the most exquisite embroidery, but for now thanks for letting me share my first India-inspired pieces with you. Gorgeous work, Tara! Looking forward to most posts on the India trip. Saw the Indian textiles exhibition at the V & A in London recently- such mind blowing craftsmanship. Thanks so much Leslie. I would have loved, loved, loved to see the V&A exhibition. The little snippets I've seen online looked divine. Well done. They're both beautiful. Glad you're back blogging. I was missing it. I think I've already got the next post in mind! Thanks Sandra, I was really happy with how they turned out. 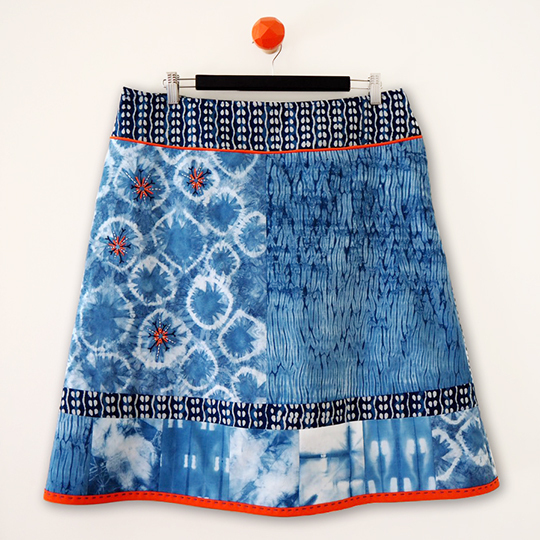 The skirts are beautiful, and really enjoying your blog. See you on Sunday morning for more embroidering! Oh thanks Kate. Did you find the information on San Antonino? I can send you the link if you couldn't. I'm looking forward to seeing how you're all going with the stitching.